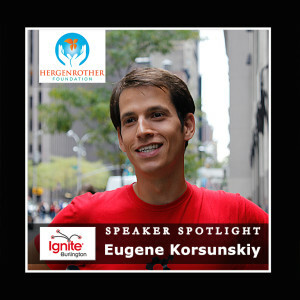 Eugene Korsunskiy is the Senior Coordinator of Design Initiatives at UVM, where he teaches classes on Design Thinking and Designing Your Life. Before coming to UVM, Eugene taught at Stanford, where he received his MFA in Design 2012. His masters project, called SparkTruck, was a delivery-truck-turned-classroom-on-wheels, filled with maker tools and supplies, which he and his friends drove across the country to teach kids about tinkering, design, and creativity. This entry was posted in Events, Ignite Burlington, Ignite Speaker and tagged adam hergenrother, eugene korsunskiy, eugene korsunskiy design and creativity, eugene korsunskiy uvm, hergenrother enterpries, hergenrother foundation, ignite 2015, ignite burlington, ignite burlington 2015, ignite burlington 2015 speakers, ignite events vermont, ignite vermont on August 3, 2016 by Hallie.